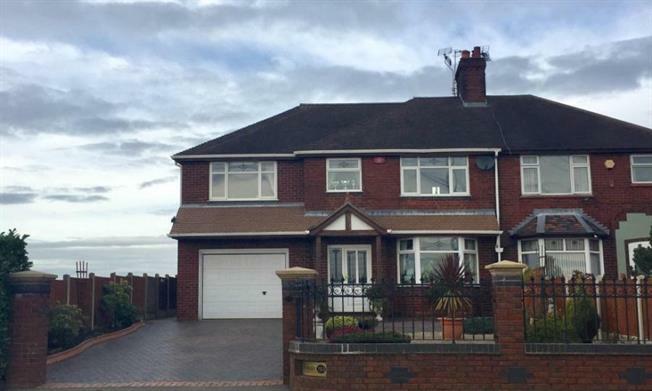 4 Bedroom Semi Detached House For Sale in Stoke-on-Trent for Offers in excess of £300,000. Fantastic extended family home with four bedrooms, flexible reception space and a large kitchen diner. Externally the property benefits from a large block paved drive enclosed by decorative railings and wiring for electric gates and a larger than average garden to the rear. Well maintained and attractively decorated throughout the property is nicely positioned with amenities within walking distance and easy access to major road networks. The accommodation comprises, hallway, WC, lounge, family room, kitchen/breakfast room, family bathroom, four bedrooms, with the master benefitting from a walk in dressing room and en-suite. A great versatile family home. Hall providing access to ground floor reception space and stairs to first floor. Carpeted, light point, double glazed window and door. Lounge diner with feature fire surround and inset fire, decorative cornicing, carpeted, light point, double glazed bay window and double glazed patio doors. Consisting of low level w.c and hand wash and hand wash basin, tiled splash back, light point and double glazed window. Generously sized sized master bedroom with dressing area and en-suite facilities. Carpeted, light point and double glazed window. With a range of fitted wardrobes, carpeted, double glazed window. En-suite shower room consisting of shower cubicle and shower, low level w.c, hand wash basin, tiling to wall and floor, double glazed window. Double bedroom, carpeted, light point and double glazed window. Single bedroom, light point, double glazed window. Contemporary family bathroom consisting of bath, low level w.c and hand wash basin fully tiled, double glazed window.